Sullivan, Barbara Jean (née Knapp)... Passed away peacefully, surrounded by her family on Thursday, April 4th, 2019. Beloved wife of Brad Sullivan for 38 years. Loving Mom of Steven & his wife Cindy, Kelly & her husband Frank and Greg & his wife Shelley. Proud Nanny of 10 grandchildren. 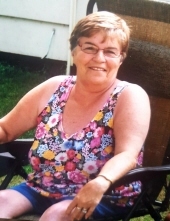 Born and raised in Aurora, Barb lived in Campbellford over 30 years. Barb was a lover of nature and a force of nature herself. She was a creator, gardener, artist and a strong willed beautiful soul. A Celebration of Barb's Life will take place at WEAVER Life Centre - Campbellford, 77 Second St. on Saturday, April 13th, 2019 from 1-4. Pastor Nate Denhoed will be sharing at 2 PM. In lieu of flowers, a donation may be made to the Canadian Cancer Society. "Email Address" would like to share the life celebration of Barbara Jean Sullivan. Click on the "link" to go to share a favorite memory or leave a condolence message for the family.